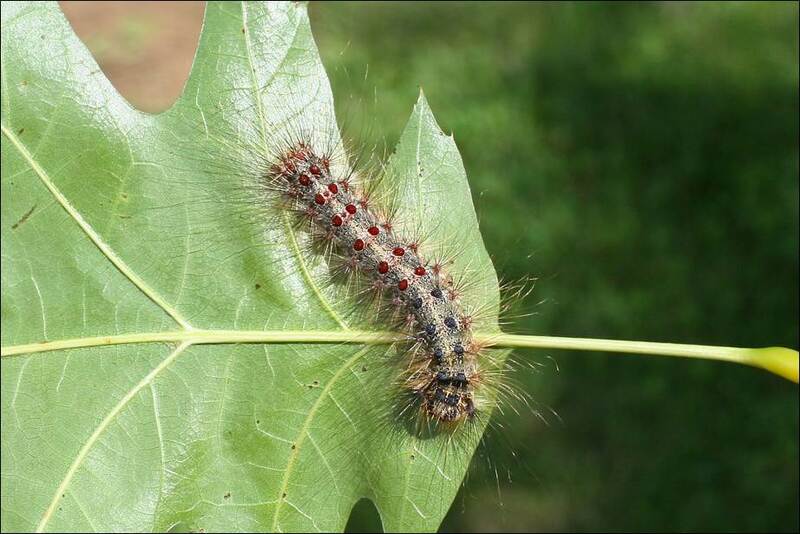 If you are seeing gypsy moth egg masses and are interested in learning if the area could qualify to be part of the ODA Gypsy Moth Suppression Program, here are some details. Proposed block must be located in a county that has been designated quarantine for gypsy moth by ODA. See map below. Counties in red are in the quarantine. Proposed block must contain a minimum of 50 contiguous forested acres. Proposed block must have a concentration of at least 250 egg masses per in residential forested areas or 1000 egg masses per acre in uninhabited forested areas. Proposed block must have a tree canopy that covers no less than 50% of the block. Proposed block must consist of at least 35% of tree species that are either susceptible or slightly resistant to the gypsy moth. Proposed block must receive a favorable T & E Assessment from ODNR and the US F & W Service. Once approved, cost share payment from the landowners will be due by March 1 of the treatment year. To be considered for the 2018 season, applications must be completed and turned into ODA by September 1, 2017. Questions about the program can be directed to the email PlantPest@agri.ohio.gov, or telephone (614) 728-6400.